Putt-Putt has to find a number of important objects before he qualifies for the Cartown 500 race: high powered, high octane gasoline, 4 racing tires, a safety helmet for Pep, and a flag with a specific number on it. When all of the objectives are completed, Putt-Putt is allowed to enter the race. 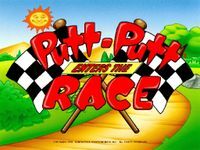 The player is then allowed to race as Putt-Putt at the end of this game, the first time in the series where the Putt-Putt can be directly "driven." Source: Wikipedia, "Putt-Putt (series)", available under the CC-BY-SA License.